Throughout human history, when a military force and its economic center has been defeated, it contracts, then collapses. For the first time in human history, the self-proclaimed “Islamic State” (ISIS), has managed to reverse this fundamental aspect of reality – but not without help. Facing defeat in Syria as government forces backed by its Russian and Iranian allies close in on the terrorist organization, stripping it of territory it seized, it has managed to spread far beyond Syria’s borders, establishing itself in Libya, Afghanistan, and even as far as Southeast Asia where it has seized an entire city in the Philippines’ south, and carried out attacks and conducting activities everywhere from Indonesia and Malaysia to allegedly Thailand’s deep south. It should be remembered, according to Western governments and their media, the territory ISIS holds in Syria is allegedly providing it with the summation of its financial resources and thus the source of its fighting capacity. According to official statements, the US and its European allies allege that ISIS fuels its fighting capacity with “taxes” and extortion as well as black market oil sales – all of which are derived from territory it holds in Syria. Weapons, vehicles, employee salaries, propaganda videos, international travel — all of these things cost money. The recent terrorism attacks in Paris, which the Islamic State has claimed as its own work, suggest the terrorist organization hasn’t been hurting for funding. David Cohen, the Treasury Department’s Undersecretary for Terrorism and Financial Intelligence, described the Islamic State last October as “probably the best-funded terrorist organization we have confronted” — deep pockets that have allowed the group to carry out deadly campaigns in Iraq, Syria and other countries. Unlike many terrorist groups, which finance themselves mainly through wealthy donors, the Islamic State has used its control over a territory that is roughly the size of the U.K. and home to millions of people to develop diversified revenue channels that make it more resilient to U.S. offensives. Its main methods of generating money appear to be the sale of oil and antiquities, as well as taxation and extortion. And the group’s financial resources have grown quickly as it has captured more territory and resources: According to estimates by the Rand Corporation, the Islamic State’s total revenue rose from a little less than $1 million per month in late 2008 and early 2009 to perhaps $1 million to $3 million per day in 2014. With this territory quickly shrinking and the intensity of fighting against what remains of ISIS in Syria and Iraq expanding, it is seemingly inexplicable as to how ISIS is expanding globally, instead of contracting and collapsing. The Washington Post’s already implausible thesis regarding ISIS finances – based on official statements from the US Treasury Department and US corporate-funded policy think tanks like Rand – appears to be the only thing contracting and collapsing. I think our next steps on the global war to defeat ISIS are to recognize ISIS is a global issue. 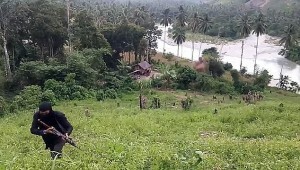 We already see elements of ISIS in the Philippines, as you’re aware, gaining a foothold. Some of these fighters have gone to the Philippines from Syria and Iraq. We are in conversations with the Philippine Government, with Indonesia, with Malaysia, with Singapore, with Australia, as partners to recognize this threat, try to get ahead of this threat, and help them with training – training their own law enforcement capabilities, sharing of intelligence, and provide them wherewithal to anticipate what may be coming their direction. More than 70 percent of Iraqi territory that was once held by ISIS has been liberated and recovered. ISIS has been unable to retake any territory that it has been – that has been liberated, and almost 2 million Iraqis have returned home. And this is really the measure of success, I think, is when conditions are such that people feel like they can return to their homes. Similarly, over in Syria, we’re assisting with the liberation of Raqqa, which is moving at a faster pace than we originally anticipated. The steps outlined by Tillerson to combat ISIS sidestep strategic fundamentals like identifying, isolating, and eliminating the economic and financial source of the organization’s fighting capacity, and instead focus on an indefinite justification for global US military operations – particularly across Southeast Asia at a time when the region is incrementally uprooting American influence and replacing it with Eurasian alliances, networks, as well as military and economic blocs. For ISIS – fueled by resources found only within the boundaries of its meager and shrinking territorial holdings in Syria and Iraq – to be simultaneously fighting the national armies of Syria and Iraq, backed by Iran, Russia, Lebanon’s Hezbollah, and allegedly a US-led coalition including dozens of countries, all while expanding its reach worldwide, including full-scale military operations in Southeast Asia, begs belief. ISIS doing all of this with multi-billion dollar multinational state sponsorship, not only makes much more sense, it is the only explanation. Until recently, ISIS territory butted directly against the borders of NATO-member Turkey. In fact, looking at any map of the Syrian-Iraqi conflict with ISIS revealed what appeared to be logistical trails leading directly out of Turkey and to a lesser extent, Jordan. 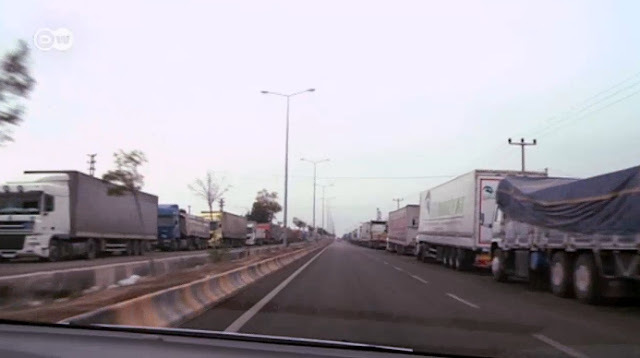 A 2014 report from Germany’s public broadcaster Deutsche Welle, revealed a torrent of supplies, men, and weapons flowing daily over the Turkish-Syrian border, headed directly toward ISIS territory, directly under the nose and with the complicity of Turkish officials. So obvious was the logistical support for ISIS flowing from Turkey, that ISIS flags were clearly visible from the Turkish border throughout DW’s footage. It was only until Russia’s military intervention in Syria upon Damascus’ request, that these logistical routes were targeted and significant pressure could be placed on ISIS inside Syria, rolling back its fighting capacity. There is also the fact that ISIS and Al Qaeda along with their various affiliates and allies have swept alleged “moderate rebels” from the battlefield. These are alleged “rebel groups” that have supposedly received hundreds of billions of dollars of support from the US and its allies in the form of weapons, vehicles, training, logistical support, and even covert military support. ISIS and Al Qaeda’s ability to sweep these forces from the battlefield indicates a fighting capacity driven by even greater financial support. But if ISIS has greater financial support than multi-billion dollar multinational state sponsorship, where is it getting it? This question, coupled with the obvious fact that ISIS is indeed fueling its fighting capacity from well beyond the borders of territory it occupies, indicates that the US and its allies, including NATO-member Turkey, never were backing “moderate rebels,” and for the entire duration of the Syrian conflict – and even beforehand – were arming and supporting extremists, including Al Qaeda and those affiliates that would later form ISIS itself. 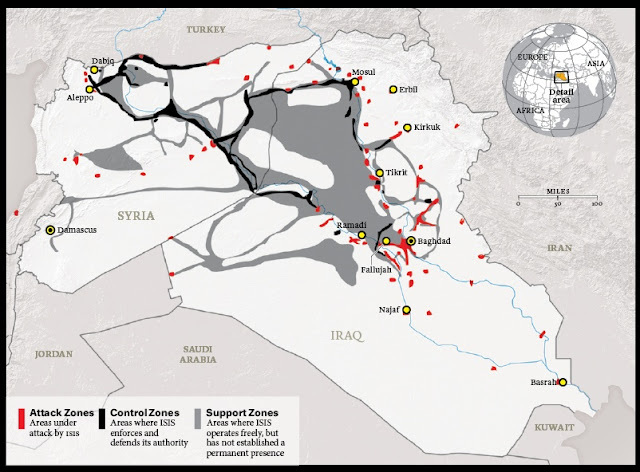 ISIS enjoys a global reach few nation-states could achieve because it is financially, politically, and militarily backed by nations with the resources to obtain that global reach. This includes the US itself, NATO, and the Gulf Cooperation Council (GCC) which in turn includes nations like Saudi Arabia, the United Arab Emirates (UAE), and Qatar. 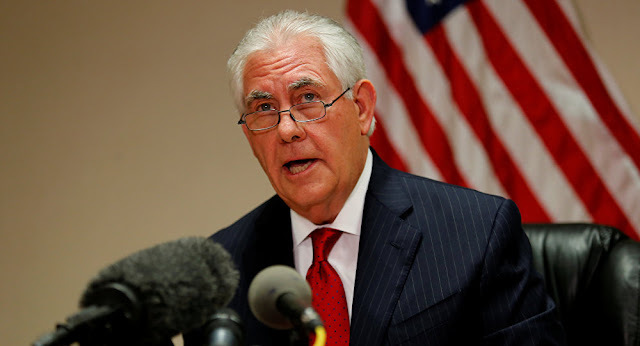 US Secretary of State Rex Tillerson’s comments regarding ISIS’ spread into Southeast Asia implied long-term US involvement in the region, including closer involvement with regional police and even military forces. 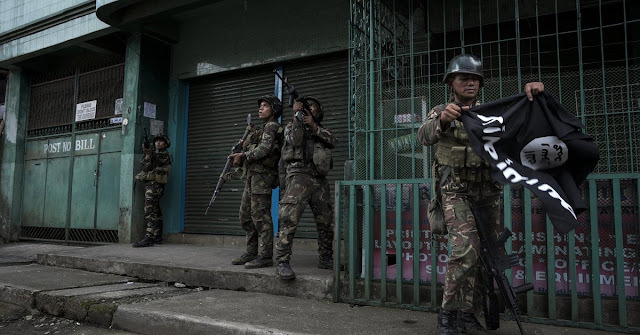 In the Philippines, where US-Philippine relations were spiraling downward, the sudden appearance of ISIS there and the organization’s ability to seize an entire city led directly to justification for not only a continued US military presence in the country, but its expansion. Other nations across Southeast Asia – including Indonesia, Malaysia, and Thailand – have been incrementally pushing US influence out of the region in favor of stronger and more stable ties with each other and with neighboring China. Thailand for instance, has begun replacing aging US military hardware with weapon systems from Russia, China, and Europe. Thailand has also begun joint military exercises with China, ending America’s post-Vietnam War monopoly. Thailand and Indonesia have also begun striking a series of economic and infrastructure deals with China, including immense expansions of their respective national railways. As each nation has taken steps to move the US out of Asia, the US has increased pressure on each respective nation. It has done this through US-funded fronts posing as nongovernmental organizations (NGOs) and US-backed opposition movements. It also appears to be doing this through the introduction and expansion of ISIS activity in the region. It should be remembered that it was the US itself that created Al Qaeda in the mountains of Afghanistan to fight the Soviets in the 1980s. It was also the US Defense Intelligence Agency (DIA), in a leaked 2012 memo, that noted the US and its allies sought the creation of a “Salafist” (Islamic) “principality” (State) in eastern Syria precisely where the Islamic State currently resides. The purpose of creating this terrorist organization was to “isolate the Syrian regime.” Thus, it is all but admitted that ISIS is a tool of US geopolitical manipulation. If it created and used ISIS in Syria to “isolate the Syrian regime,” why would it hesitate to likewise use it in Southeast Asia to reverse its waning fortunes? Tillerson’s comments regarding ISIS are in essence, a veiled threat – a threat of long-term chaos sown by ISIS that will continue without expansive capitulation to US interests, including an expanding US military footprint in the region, conveniently in a region the US has long designated as essential toward the geopolitical, military, and economic encirclement and isolation of a rising China. However, such a ploy cannot unfold if the nations of Southeast Asia both expose this reality, and align themselves with nations truly invested in the defeat of ISIS, including Russia and China – the ultimate targets of America’s geopolitical ambitions and the final destination for America’s global terrorist proxies.